Jubilee USA is celebrating passage of the Doha Accord, a major step forward in developing solutions to the international debt crisis. The Missionary Oblates is a member of the Jubilee USA coalition and has a seat on the Board. Last week during tough and divisive negotiations in Qatar, Jubilee USA – working with governments and international partners – secured a strong mandate on debt and responsible lending and borrowing. This United Nation’s consensus-built accord means the work of the United Nations Committee on Trade and Development (UNCTAD) will be renewed for the next four years. UNCTAD has served a vital role in consensus building on debt relief initiatives such as HIPC and MDRI that have resulted in more than 100 billion dollars in debt relief. Currently Jubilee serves as an expert to UNCTAD and has helped develop principles on responsible lending and borrowing – an actual solution to the international debt crisis. UNCTAD’s renewed mandate will allow them to build an international consensus on responsible lending and borrowing. However – winning the new mandate was hard fought and hard won. A week before negotiations began on UNCTAD’s renewal, there was a release of negotiating documents which illustrated that some developed countries were seeking to weaken and even eliminate UNCTAD’s mandate on debt, financial reforms and continued consensus building on principles of responsible lending and borrowing. It seemed likely that there would be a North/South divide and the support of this effective UN body would end – but with the mobilization of significant pressure and the strong support of the Chinese – Jubilee and their allies won. Jubilee USA staff were in contact with decision makers at the White House, Treasury and State Department during negotiations in Qatar and were able to meet with US government negotiators. Please read their thank-you letter to President Obama for joining Jubilee and ensuring a strong mandate for UNCTAD on debt relief and promoting financial reforms. 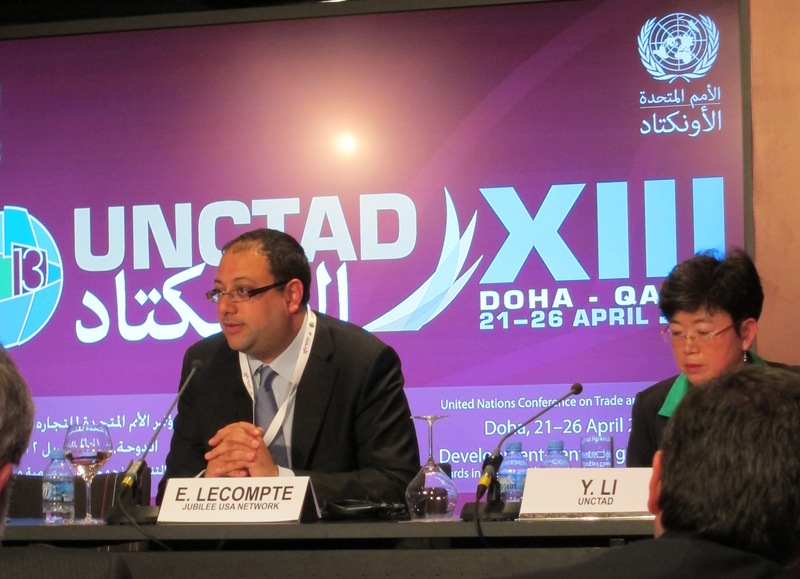 Eric LeCompte, Jubilee USA Executive Director, was hosted for these negotiations by UNCTAD to moderate a panel with 11 financial ministers and treasury heads from around the globe to speak in support of UNCTAD’s principles on responsible lending and borrowing. You can watch and hear this panel here and see UNCTAD’s press release here.